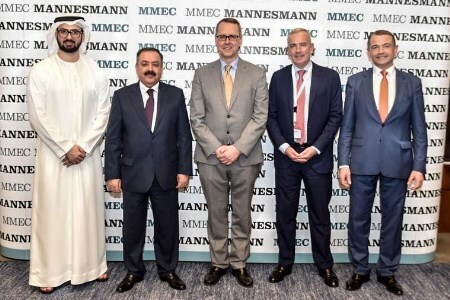 MMEC Mannesmann GmbH (MMEC), a global leader in engineering, procurement and construction (EPC), has announced the opening of its branch office in Abu Dhabi that will function as a regional headquarters to meet the growing demand for speciality services in oil and gas, chemicals, metals and mining and renewables sectors in the Middle East region. The German engineering contractor is known for executing complex projects (upstream and downstream) for oil and gas and chemical and petrochemical industries, covering the entire cycle from early project development, feasibility studies, including hydraulic and case studies, conceptual and basic design, front end engineering design up to the implementation of turnkey projects. The company which has more than 50 years of experiencing implementing projects over 80 countries is currently working on a number of projects across the region, including the recently won sulfur pipeline project by ADNOC Sour Gas in Abu Dhabi. The large-scale EPC turnkey contract awarded earlier this year involves installing the entire pipeline system with a capacity to transport 10 000 tpd liquid sulfur, 50% over current capacity, to sulfur granulation station, around 11 km north, via pipeline. Under the leadership of General Manager Anas Al Juaidi, the Abu Dhabi team will work closely with existing office in Dubai and the headquarters in Germany towards strengthening the company’s presence in the region and leverage on the opportunities arising from the oil and gas, chemical and mining sectors. “On the back of oil price going up by more than 60% in the past two years, reaching today equivalent levels of 2015, the Middle East and North Africa (MENA) region’s economy is projected to grow at over 3% in 2019, and, according to the World Bank, is expected to remain strong for the next two years. This, along with various on-going policy and economic reforms, will continue to drive growth for key infrastructure, oil and gas, mining and renewables sectors,” said Oliver Apelt, CEO, MMEC Mannesmann. MMEC Mannesmann has been executing a wide range of services for complex projects in the region, including Water Transmission System – Phase 1&2 – Fujairah, Petroleum Coke Calcining Plant – UAE, North East BAB - Phase 1 – UAE, Petroleum Coke Calcining Plant – Bahrain, and Sohar Calciner – Oman. The Middle East and Africa region contributes significantly to the company’s total business volume. "We consider our decision to open an office in the UAE is a significant strategic move and has come at a time when the region is going through an exciting period. This will allow us to collaborate with new partners and leverage on the new opportunities that this region offers,” he said. “We are excited to expand our presence in the UAE to develop new and deeper co-operation with local clients with whom we wish to achieve a common goal of delivering world-class projects in most smart, safe and sustainable manners, using our global expertise and technological know-how,” said Anas Aljuaidi, General Manager, MMEC Mannesmann. “With a strong local base, we are committed to helping our customers to invest in, explore and develop new projects, and look forward to further contributing to the region’s development legacy," he continued. MMEC Mannesmann, which was operating until first quarter 2016 under the name of Technip Germany as member of Technip Group, uses its experience of working on a diversified range of projects and technologies across the industries to select and recommend the best solutions for its customers. MMEC also offers licensing for the leading petroleum coke calcining technology and supply required propriety equipment. It has already offered this technology for Carbon Black project of Takreer.